Artist Nikki Ward combines found materials in a way that reflects her very personal exploration of art and nature. 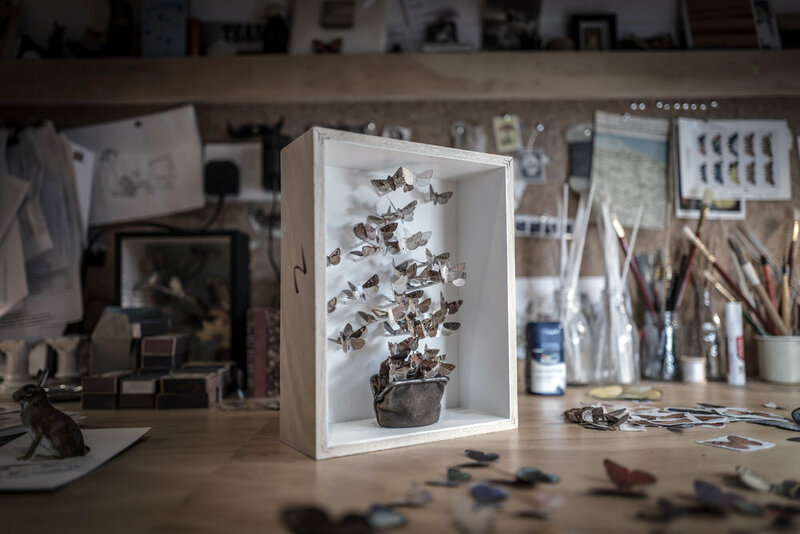 In her exquisite works, Ward incorporates cut outs from old books and salvaged items such as vintage purses, matchboxes and dolls’ house furniture, into three-dimensional collages and montages housed in custom-made wooden boxes. 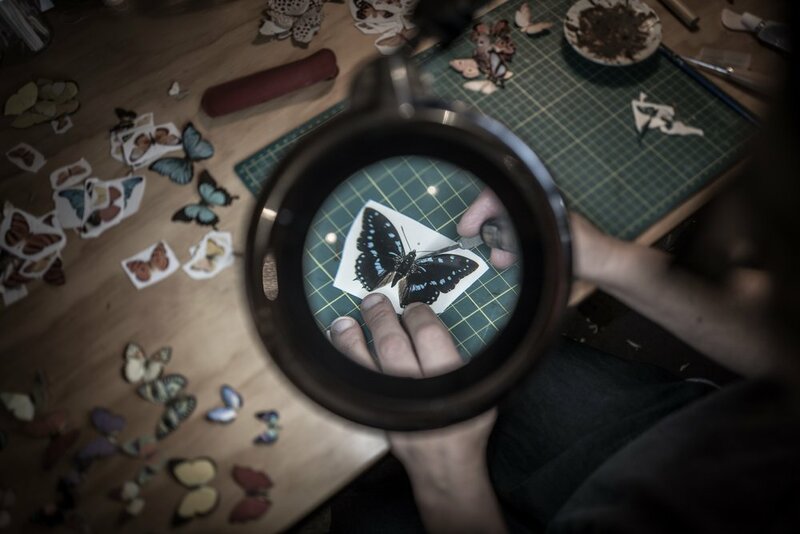 Through careful reconstruction of found materials, and the piecing and assembling of paper insects and mammals, she explores the nature of transformation, repurposing, metamorphosis and preservation, bringing whole new worlds into play. In Ward’s singular reinvention of once-loved treasures, the objects become engaged in wondrous performances. 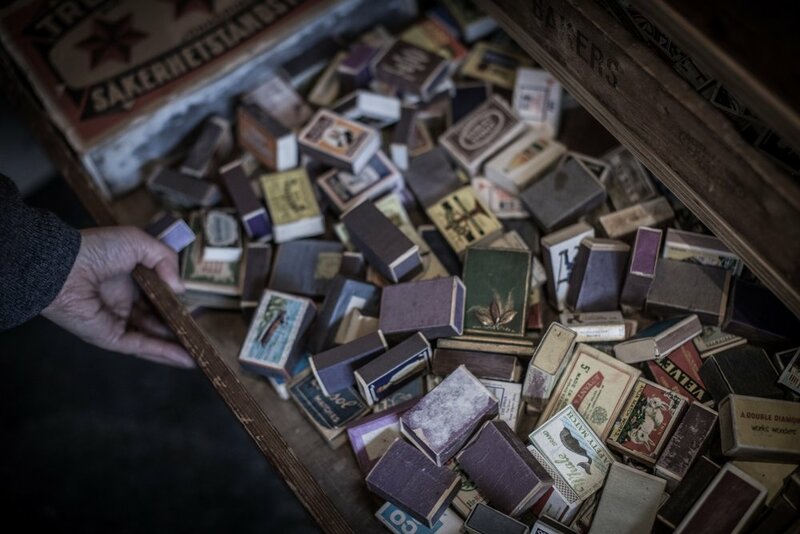 “I believe I am imparting in these decaying artefacts a new narrative and a renewed value”, she says. Earlier this year, she talked to me about her creative evolution, the influence of her mother and the importance of the unhurried approach she takes to her craft. Claire: How did it all start – was there a specific moment that inspired you to begin making your artworks? Nikki: I’ve always been into the creative arts, from college and university through to working in costume and street theatre, then I had a hiatus where motherhood took over. But one year when it was my mother’s birthday, I wanted to make her a card with a three-dimensional quality. I made something from cut out books and that’s where the art I’m now making seems to stem from. Claire: What were you doing before that? Nikki: After leaving school rather shockingly early (licensed by my rather hippy mother), I did an apprenticeship as a hairdresser, but this didn’t fulfil my creative instincts. Then in my early twenties I did a BTEC diploma in general art and design and from that went on to a BA Hons degree in Visual and Performing Arts at the University of Brighton. After graduating I worked with street theatre company Mischief La-Bas, both making costumes and performing. Claire: Where do you find inspiration? Nikki: I think a huge debt inspiration-wise goes to my mother. She was a brilliant artist and could draw with ease and majesty. Among other things she used to decorate harpsichords. She made a lot of observational drawings from nature and I still have a beautiful painting of a butterfly that she did when I was a child (pictured below). So I think my inspiration comes from her, and nature and nostalgia in general. Claire: Could you describe your work in a sentence? Nikki: Gosh, that’s difficult. I think the meaning of a piece of art shouldn’t be prescribed. It’s up to the observer to find reason, or not, as they wish. So I’d describe my work very literally: paper-cut sculptures made from old books and artefacts housed in traditional taxidermy boxes. Claire: Where do you source the materials for your work? Nikki: All over the place, but mostly from charity shops, car boot sales, junk shops, Ebay and elsewhere on the internet. I also have things given to me. Claire: Has your work evolved over the years? Nikki: Yes it has, but very slowly. I see no reason to rush things. I would rather let it change and develop at its own pace. Certainly if I look back at the art I made five years ago, what I’m doing now is more considered and mature. I think more about why I’m using certain labels and how the patterns and colours relate to them than I used to. Claire: Can you give us an insight into how you work and an indication of how long it takes to produce a piece? Nikki: My pieces vary in size, so of course that has an effect on how long they take to make. The pieces evolve too as I’m making them and certainly the dioramas will grow and change and there’s no defined length of time for creating them. I have an idea and start building, but this can often move in a different direction and take longer, or not work at all. Claire: What was the best piece of advice you’ve received. Nikki: As a self-employed artist who creates work from bought second-hand objects, the best advice I’ve had is, ‘keep your receipts’. Claire: Where do you look if you’re in need of creative inspiration? Nikki: I don’t ever feel uninspired, so it’s difficult to answer this. I think I’m still inspired by my mother’s work, I’m inspired by exhibitions and the work of other artists and by nature and junk in shops, and life in general. But I never feel I need to specifically seek inspiration out. Claire: What is your most prized possession? Nikki: My workshop. It’s the garage next to the house. My husband converted it into a studio space with a huge desk and shelves and drawers and everything I need for my artwork. It’s a real luxury these days to have a space solely for creative art. 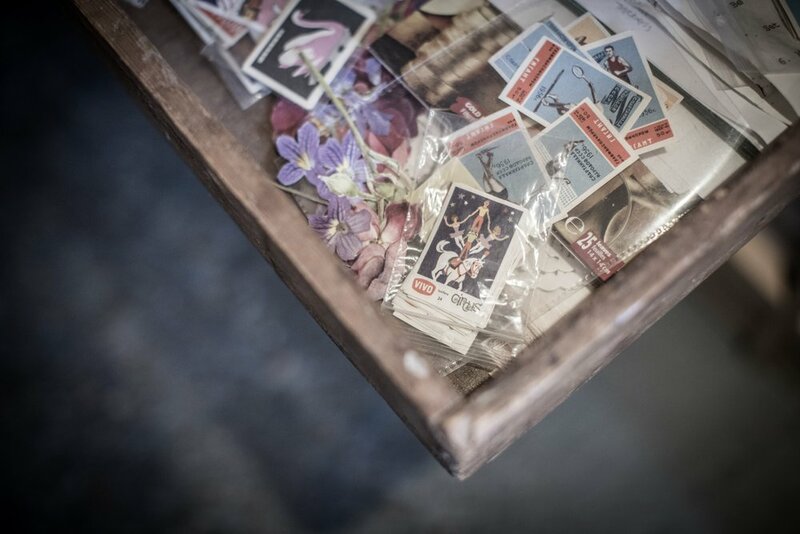 Claire: Do you have any keepsakes that you wouldn’t incorporate into your work? Nikki: Yes, I have a whole shelf of things I like to look at for inspiration but don’t plan to use in pieces, although who knows, perhaps they’ll make their way into one of my boxes some time! 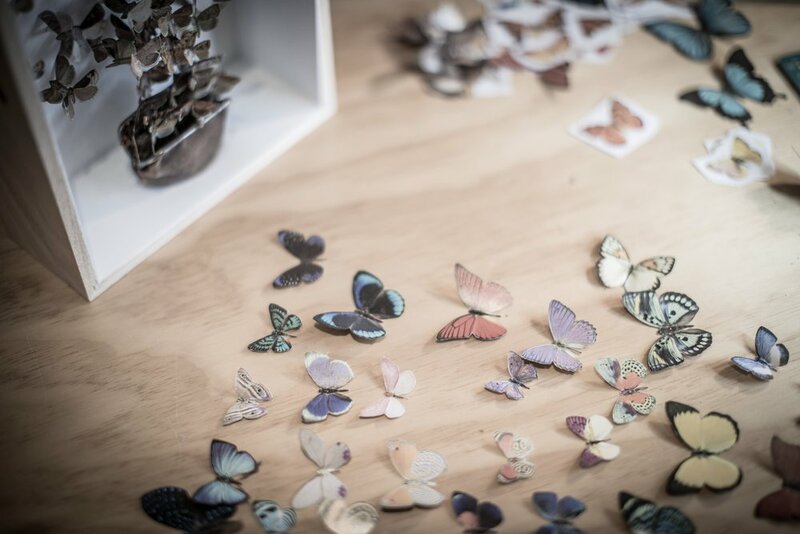 I have some real butterflies and moths which have been given to me – of course I don’t use real ones in my work, only paper, but they’re beautiful gifts. And I have a sparkly ‘shrine’ to Robert Pattinson that my daughter made for me some years ago, which makes me smile. Claire: Are there other creative people whose work you enjoy following? Nikki: I love the work of Lewes-based artist Flo Snook, who draws chiefly (though not exclusively) on Sussex landmarks (Brighton’s West Pier, the Royal Pavilion etc), which are printed onto fabric and then embroidered. 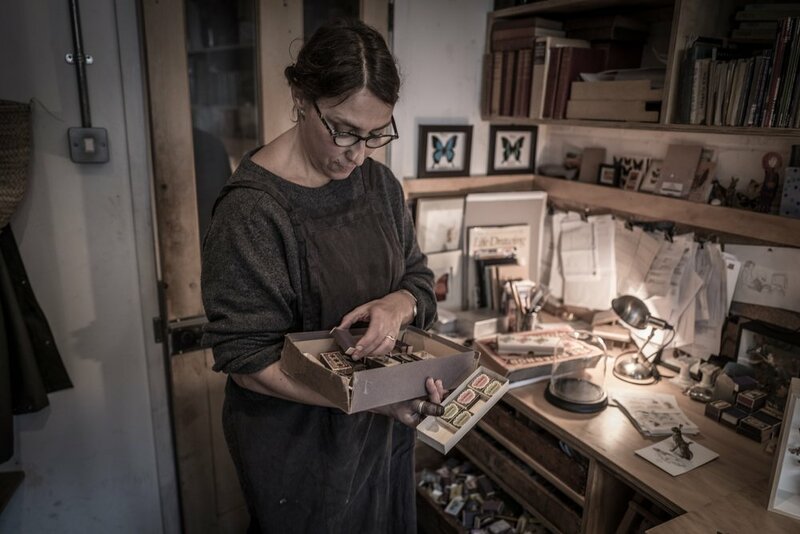 Jo Coles is another Brighton maker who works in a broad mixture of mediums. She does all sorts of eclectic work from collections of things to figures made from found natural objects. In London, Rachael Causer makes beautiful work too, focusing on visible mending, mono-prints and collected found notes. Claire: Who are your art icons? Nikki: There are so many, but picking a few out of the air: Rebecca Horn, Jenny Saville, Joseph Cornell, Su Blackwell, Maria Rivans and Sir Peter Blake. Claire: What was the last exhibition you saw? Nikki: ‘A Certain Kind Of Light’ at The Towner Gallery in Eastbourne. The show explored artists’ responses to light and included paintings, sculpture, video and installation from almost thirty artists - among them Rachel Whiteread and Anish Kapoor. My favourite was an installation by Katie Paterson staged in a darkened room, with a huge disco ball reflecting light all over the space like stars. Claire: Which song makes you feel instantly happy? Nikki: ‘Smile’ (composed by Charlie Chaplin, words by Geoffrey Parsons and John Turner, sung by Nat King Cole). My daughter sang it at primary school. Claire: What music to you listen to while working? Nikki: I don’t listen to music, I listen to Radio 4. I’m an avid Archers fan and oh my goodness it made me cry last night! I love the 2:15pm drama and The Unbelievable Truth. The 6:30pm comedy slot is often great, and The Film Programme, and, of course, Desert Island Discs. So many! Claire:How do you spend your time when you’re not working? Nikki: I think one of the banes of being a self-employed person is that you never feel like you’re not working. But when I get the chance, sitting in front of the fire with a cat is a nice way to relax. Our cats are Matthew (black and The Boss) and John (tabby, and silly-friendly). Claire: What are your favourite places in the world? Nikki: The municipal campsite at Eu, Normandy. We’ve been visiting ever since our children were small. The first time we went it was Easter and it was gloriously warm. We went to the market in the town and it was so typically French, yet so easy to get to (20 mins drive to Newhaven - ferry - then 40 mins drive once we were in France). Les Banigots, a huge, ramshackle house in the Dordogne, where we had another wonderful family holiday. Holkham Beach in Norfolk and the magical Plantation Garden on Earlham Road in Norwich are both places I’d often go as a child. Chailey Woods, East Sussex was another great place to stroll and enjoy nature when our kids were tiny. Claire: What are some of Brighton’s best kept secrets? Nikki: I don’t think they are really big secrets, but the car boot sale at Brighton Marina, the charity shops on London Road, and Snooper’s Paradise on Kensington Gardens are favourite haunts of mine. Claire: What are your plans for the future? Nikki: To keep making work and enjoying the process of evolving and developing. I feel so privileged that people want to buy it and display it. I’d like to work towards exhibiting my work beyond Brighton and Sussex, too. Nikki Ward lives and works in Brighton. 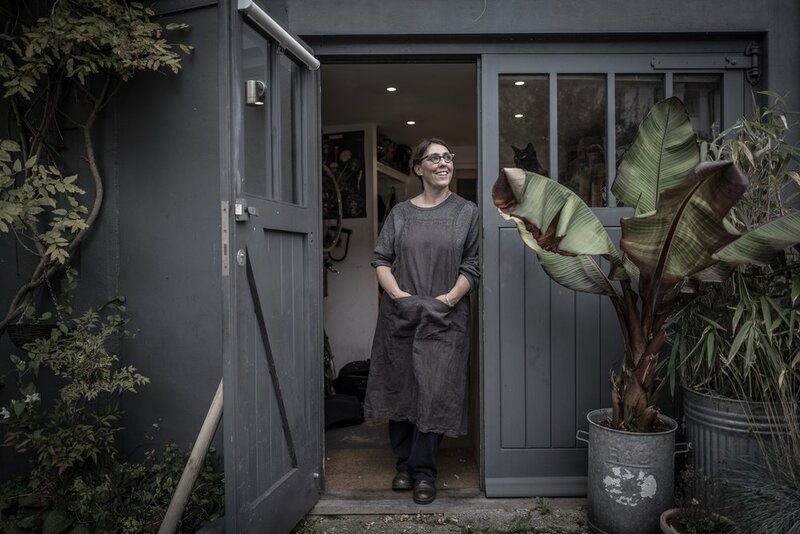 Her work can be seen at Brighton Books, 18 Kensington Gardens, Brighton, BN1 4NT and Objet Trouvé Gallery, 1 Steamer Cottages, High street, Alfriston, BN26 5TY. She also accepts private commissions.